LONDON, July 29 (Reuters) – Middle distillates remain the one ray of hope for U.S. oil refiners still struggling to clear a glut of gasoline caused by over-production earlier in the year. Stocks of distillate fuel oil are higher than normal but have been trending down for the last 15 weeks according to the U.S. Energy Information Administration. Distillate stocks are currently around 152 million barrels, almost 8 million barrels higher than at the same point last year and more than 20 million barrels over the 10-year median. However, stockpiles have fallen from a peak of 163 million barrels at the start of April, when they were a massive 35 million barrels over the same point in 2015 and 40 million barrels over the 10-year average. 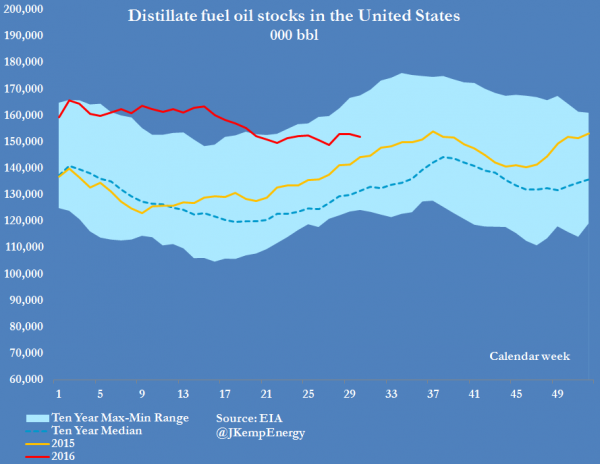 Unlike gasoline stocks, which have shown an unusual counter-seasonal build up over the first part of the summer, distillate stocks have exhibited an unusual counter-seasonal drawdown. Hedge funds have noticed the divergent trends and become much more bullish about the outlook for distillate prices than for gasoline. 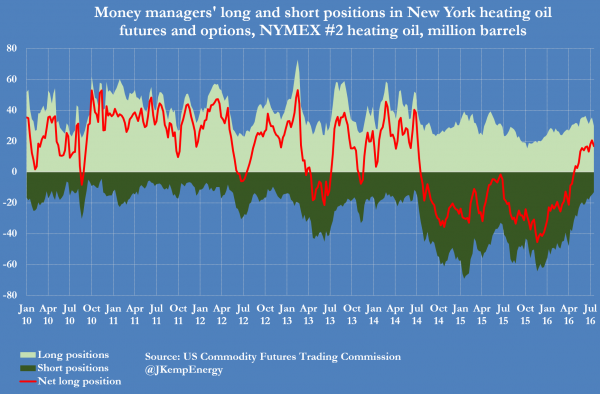 By July 19, hedge funds had amassed a net long position in U.S. heating oil futures and options equivalent to 17 million barrels. While the net long position had been cut from an earlier peak of 21 million barrels it was still one of the largest bullish positions since the slump in oil prices began in 2014. By contrast, hedge funds had essentially a flat position in gasoline futures and options, with roughly equal long and short positions. In relative terms, the net positioning was among the most bearish in the last seven years. Hedge funds and refiners are hoping distillate will get a further boost from a pick-up in freight movements and a colder winter in 2016/17. 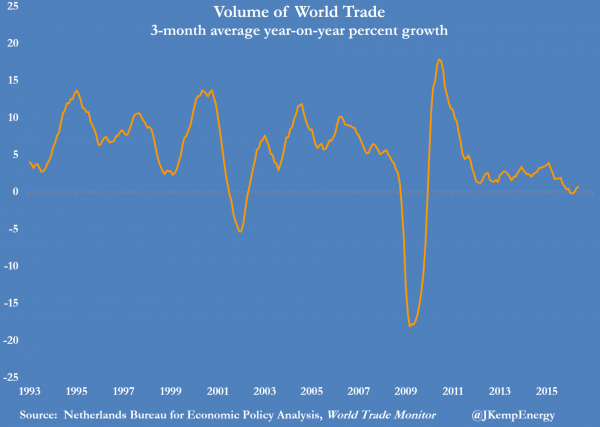 Freight demand in the United States and around the rest of the world has remained flat for the last 12 months and shows no sign of the long-predicted return to significant growth . But the weather outlook for winter 2016/17 should offer a bit more support for heating oil demand towards the end of the year and into early 2017. The first half of winter (Oct-Dec) is likely to be warmer than normal across the United States, especially in the Southwest, according to the National Weather Service Climate Prediction Center. 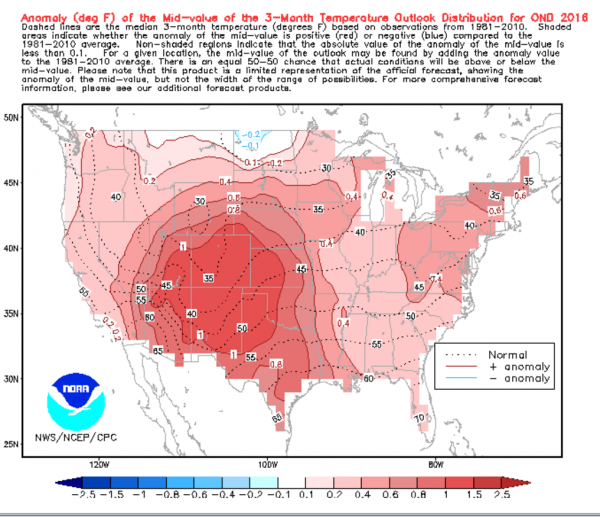 But temperatures in the second half of winter (Jan-March) are likely to be normal or below normal across much of the northern United States, where winter heating oil demand is concentrated. Long range forecasts such as these are subject to a high level of uncertainty and should be treated with appropriate caution. But the seasonal outlook is driven in part by the development of La Nina conditions in the central Pacific. 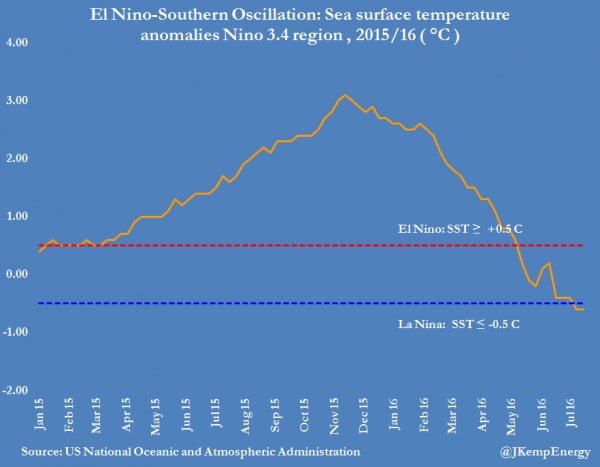 Mild La Nina conditions have developed in the last three weeks and are expected to strengthen through the end of the year. 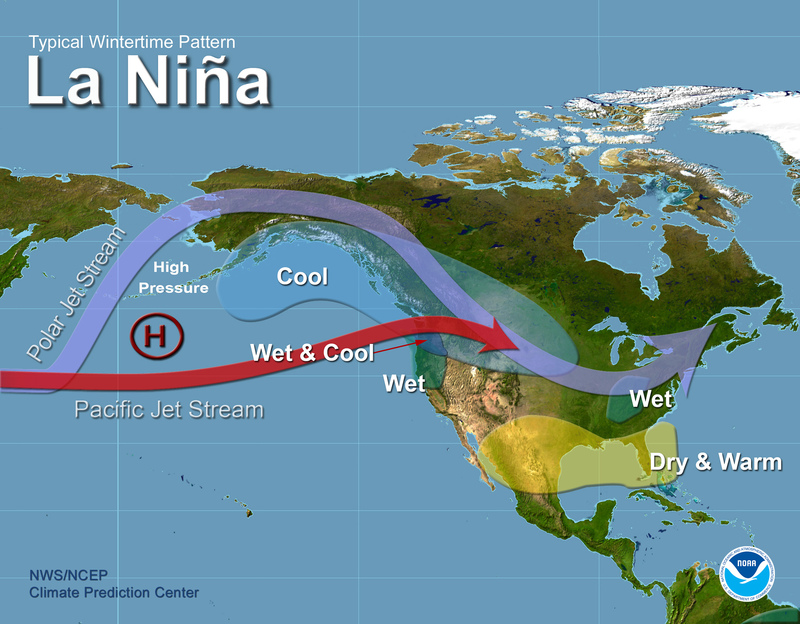 La Nina normally “favours the build-up of colder than normal air over Alaska and western Canada, which often penetrates into the northern Great Plains and the western United States. The southeastern United States, on the other hand, becomes warmer and drier than normal,” the Climate Prediction Centre says. The winter of 2016/17 might not be exceptionally cold, but it is still likely to be colder than very warm winter of 2015/16, which was characterised by one of the strongest El Nino episodes on record. Colder temperatures across the northern states in winter 2016/17 should promote more heating oil consumption. 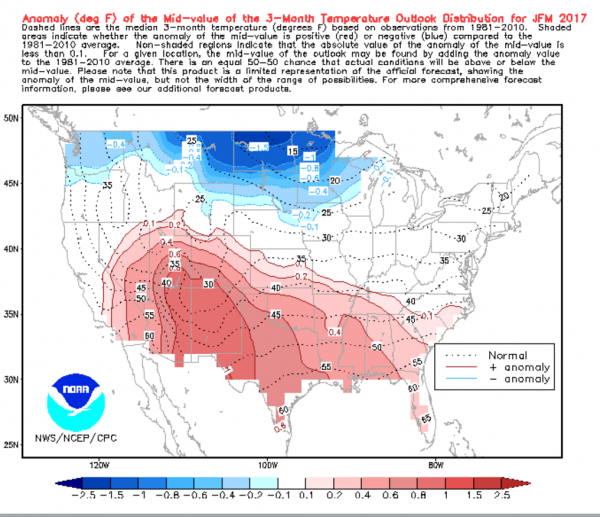 The expectation of colder winter weather has been an important influence in keeping heating oil prices strong over the summer and creating a large contango in the market. But a colder winter is also likely to mean less driving and less gasoline consumption in 2016/17 than in 2015/16. U.S. refiners have an incentive to switch away from maximising gasoline production and towards making more distillates. However, switching cut points and changing catalysts to increase distillate yields at the expense of naphtha and gasoline is unlikely to be enough on its own to bring gasoline stocks under control. Refineries will also have to reduce the total amount of crude they process in the remainder of the year. The coming winter is unlikely to see the record rates of throughput reported in 2015/16. Some of the more marginally economic refineries that run heavily between November 2015 and March 2016 may come under financial pressure to cut back this coming winter.